Omega 3 fatty acids are one of the most studied nutrients and supportive evidence shows they are beneficial for heart health, inflammation, and brain function. Omega 3 fatty acids are one of the most important nutrients that make up the nervous system and brain. The typical Western diet includes too many Omega-6 fatty acids and not enough Omega 3’s. Supplementing can help restore the optimal ratio. 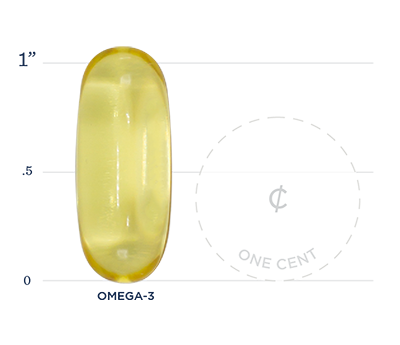 Each batch of our Omega-3 is tested to ensure an odorless product with pristine taste, reducing the common “fish reflux” noticed after taking most fish oil supplements. Supportive research shows that consumption of EPA and DHA Omega-3 fatty acids may reduce the risk of heart disease, and help the body maintain a balanced inflammatory response. Our Omega 3's come from the icy waters off the coast of Norway and contains a blend of anchovy, squid, sardine and mackerel for the purest fish oil and contain DPA, a rarer find in omega-3 supplements that is shown to help improve cardiovascular health and brain function. 1. Dyall SC. Long-chain omega-3 fatty acids and the brain: a review of the independent and shared effects of EPA, DPA and DHA. Front Aging Neurosci. 2015;7:52. 2. Ramel A, Martinez JA, Kiely M, Bandarra NM, Thorsdottir I. Moderate consumption of fatty fish reduces diastolic blood pressure in overweight and obese European young adults during energy restriction. Nutrition. 2010;26(2):168-74. 3. Li K, Huang T, Zheng J, Wu K, Li D. Effect of marine-derived n-3 polyunsaturated fatty acids on C-reactive protein, interleukin 6 and tumor necrosis factor a: a meta-analysis. PLoS ONE. 2014;9(2):e88103. 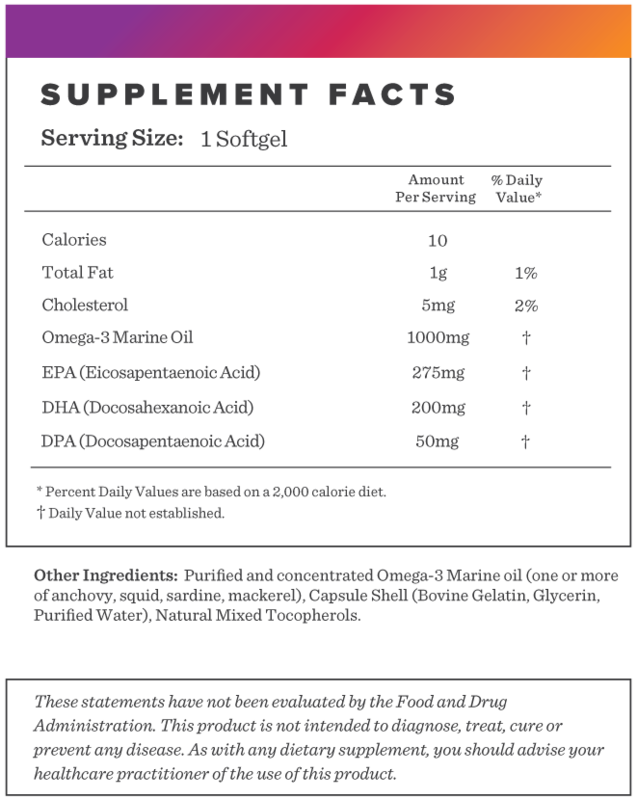 Below we've broken down the main functions of our Omega 3 and the benefits it can provide. Omega 3 fatty acids have been shown to decrease serum triglyceride levels, improve HDL cholesterol and reduce blood pressure. Long term chronic inflammation can have serious health effects, studies have shown that omega 3 fatty acids produce a reduction in inflammatory markers.